One day, a few friends of my, told me to try a BlackGate WKZ in the power supply instead of those old papaer-in-oils.... Well, BalckGate was known by me, not for its sound but more for their prices!! However, I know these friends of my, and I must say that most of the time they don't sit on their ears... So, having saved some money, I took the "risk"and ordered one in England. A 47mF+47mF/500V would substitute the two 50mF GEC oils that were in my preamp. After 5 days, the postman brought me a package with the WKZ. The test could start! I now-a-days use a Siemens Aa in my preamp and the power supply has to be as silence as can be due to thei mu of 33... My power supply is a 2mF/10He/24mF/6He/50mF/6He/50mF... The las two oils were ripped out and the WKZ was put in. In the picture at the left, you can see the unused solderlugs of the oils hanging through the chassis... The WKZ is mounted for testing (I really don't built that way..). 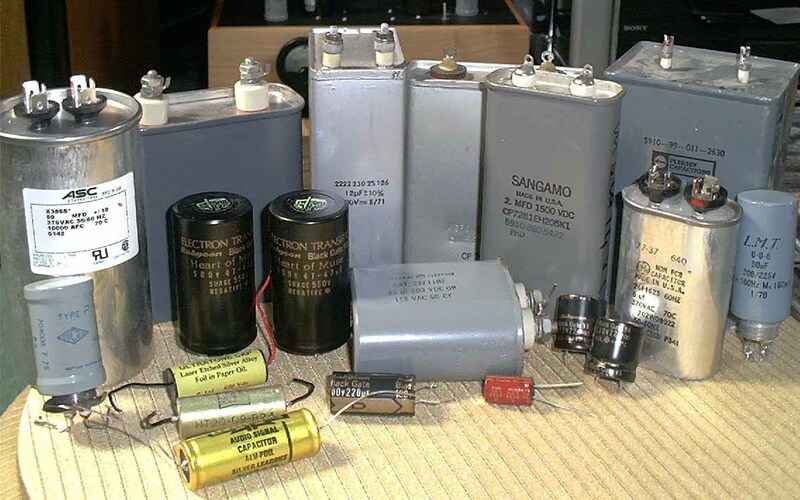 The power supply of my mono-blocks are sparate: for the driver and powertube apart. 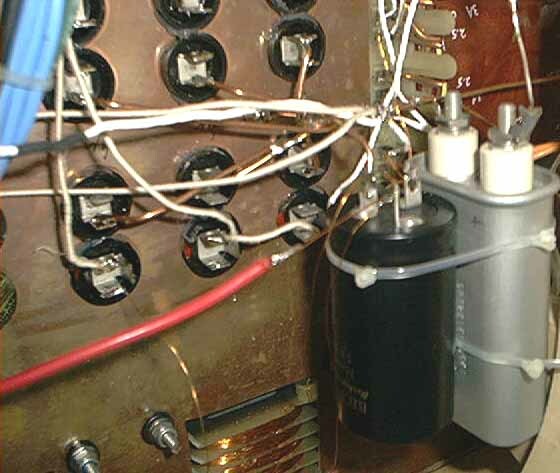 The power tube has a C-L-C-L-C at which the last two caps were replaced by a WKZ, leaving the first cap, a 2mF Oil at its place. The driver has a C-L-C powersupply. Since I run the UX171a at 135V/13mA and use a RGN1064 Telefunken rectifier, both the capacitors could be replaced by one WKZ..